Founded in 1998, non-profit organization ICANN (The Internet Corporation for Assigned Names and Numbers) oversees the Internet’s "address book" (or root zone) — the process of assigning domain names and the underlying IP addresses to keep the Internet running smoothly. But according to the contract, ICANN and its IANA department (the Internet Assigned Numbers Authority) was set to work under the supervision of National Telecommunications and Information Administration (NTIA), an agency of the U.S. Department of Commerce. That contract is ending today, and the US Commerce Department is scheduled to hand over its role to ICANN, which will now become an autonomous body, accountable to an international multi-stakeholder community which includes members from the technical community, businesses, telecommunications experts, civil society and governments. The Internet itself was designed to function without a central authority and has become a critical part of everyone’s life, as well as for the global economic infrastructures. 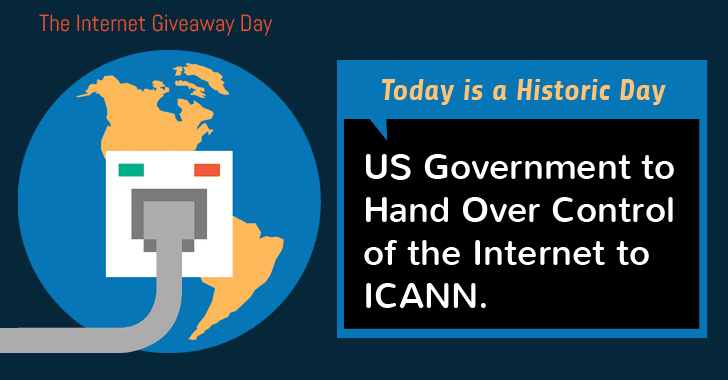 Four States Sue to Stop "Internet GiveAway"
However, this plan is not without a bit of last-minute drama. It’s already a known fact that majority of the political portion of the United States doesn’t want to give way the Internet. In fact, the process of "losing control over the Internet" has already been opposed by some conservative officials and lawmakers. Four Republican states’ attorneys general have filed a lawsuit in a last-minute effort to prevent the Obama administration from ceding control of the internet’s critical functions to ICANN, though a federal judge has already denied the request. With ICANN not under US control, the attorneys general for Arizona, Oklahoma, Nevada, and Texas, fear that "authoritarian regimes like Russia, China, and Iran will now have the ability to interfere with what should be a free and open internet." "The President doesn’t have the authority to simply give away America’s pioneering role in ensuring that the Internet remains a place where free expression can flourish," Texas attorney general Ken Paxton said [PDF]. How Does Internet Transition Affect You? But, after the Edward Snowden’s revelations of NSA’s worldwide surveillance program, Internet users don’t trust the United States, and they want the Internet to be a free and uncensored platform. Even the father of the World Wide Web Sir Tim Berners-Lee wants the Internet to be decentralized in order to eliminate middleman entirely from all aspects of the Web. However, this transition would not make any significant change for the Internet users because the companies that oversee the top-level domains, including .com, .org, and .net, are based in the United States, meaning they have to follow US law and abide by US court orders. With the help of these court orders, the US government has already shut down thousands of websites it has declared to be breaking laws about drugs, intellectual property, gambling, and others. Kim Dotcom’s Megaupload file-sharing website was also shut down in 2012 due to this. If you think that domains registered under handles outside of the United States don’t come under the US jurisdiction, then you are wrong. The US government even has international cooperation agreements with many countries, requiring foreign registries to comply with US orders. The KickassTorrents (or KAT.cr) website — the world’s most notorious file-sharing sites — is the best example of this kind. While the main site was registered with the .cr domain by the Costa Rican register called NIC, it was shuttered at the request of the United States this summer and its operator was arrested in Poland and charged by US authorities with varying criminal copyright infringement counts. US technology giants, including Google, Facebook, Twitter, Yahoo, and Amazon, also back the transition, arguing it will support innovation. Even former top United States national security officials, Michael Chertoff and James Cartwright, also support the transition to ICANN, despite national security fears.